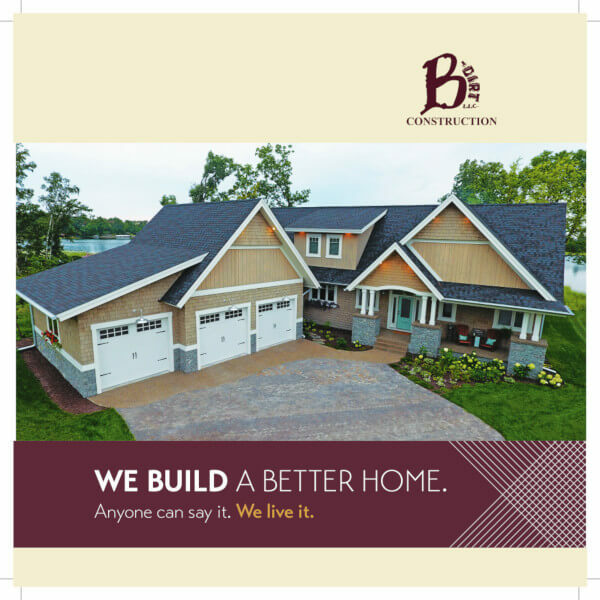 B-Dirt Construction, Brainerd custom home builder, doesn't just want to build you a home—we will build you a home to love! Your dream home awaits, and we are here to help you every step of the way. 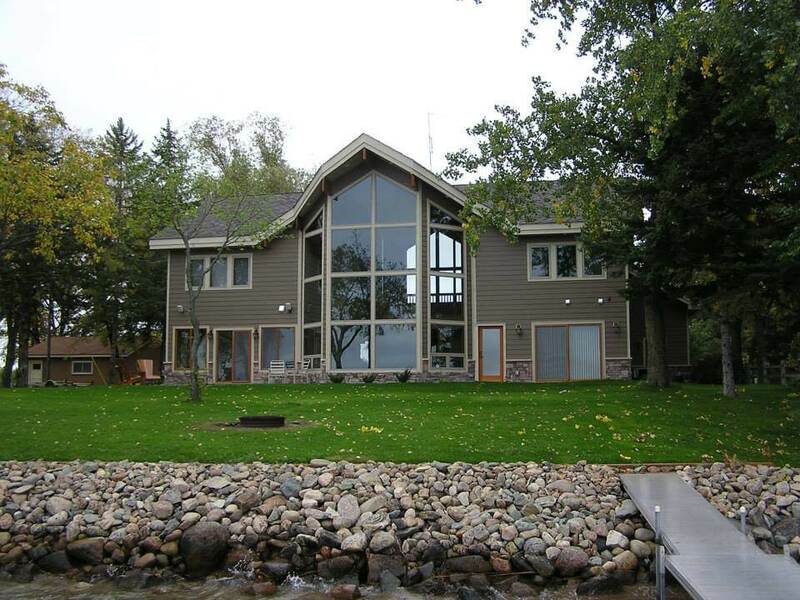 B-Dirt Construction invites you to get a glimpse of our signature style with this stunning Love Lake home. Although the exterior of the home gives it an East Coast feel, the rustic finishes bring it back to the north woods and lakes area. Ash floors and distressed barn wood beams blend well with the white ceilings and trim work to bring rustic elegance to the next level. This home also features zoned heating and a pervious driveway that makes stormwater management look gorgeous. The theater room and cozy, wood-burning fireplace keeps you warm and entertained as you look out the impressive windows. If you care to, move the fire outside to the spacious firepit and enjoy summer at the lake to its fullest. Adapt this beautiful Love Lake home or any other design to make it entirely your own. B-Dirt Construction is all about customer satisfaction, and we won't be finished with your project until you are 100% thrilled! Make the call today to B-Dirt Construction: (218) 821-5243. We look forward to building your dream! B-Dirt Construction, Brainerd new home construction company, goes above and beyond what other companies do. Not only do you become part of the family with B-Dirt Construction, our signature style is increasingly popular and getting recognized more and more. At B-Dirt Construction, we have lots to offer! We even mean that literally—B-Dirt has lots for sale to build on. If we don’t have anything available or one that meets your needs, B-Dirt Construction has a handle on what's available and on the market that will meet what you are looking for. Building a home is all about location, and our expert staff at B-Dirt Construction will find your perfect spot! We will even check properties for you if you are out of the area. 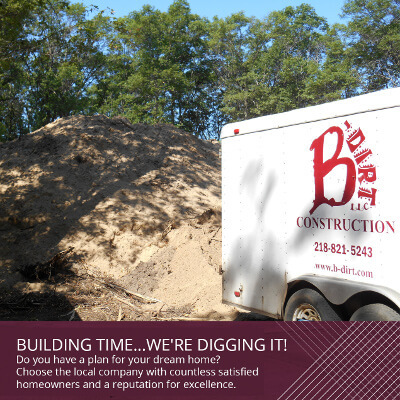 Call today for your free consultation and discover the B-Dirt Construction difference (218) 821-5243. We look forward to welcoming you to the family! 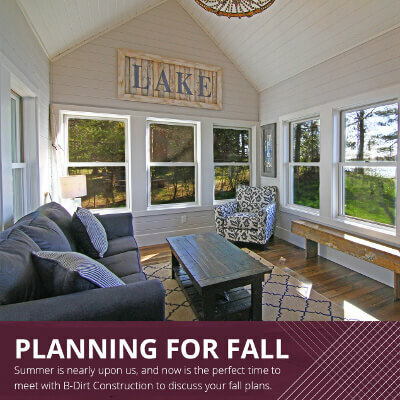 B-Dirt Construction, Brainerd's custom home builder, is here to guide you every step of the way through the building process. 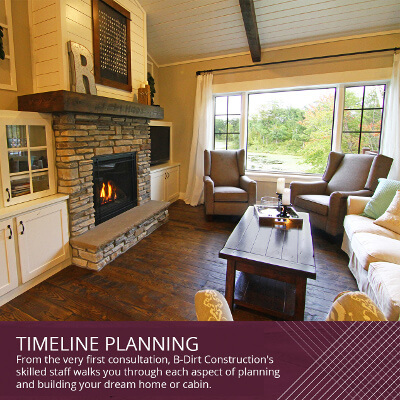 From the very first consultation, B-Dirt Construction's skilled staff walks you through each aspect of planning and building your dream home or cabin. People often wonder what the time frame is from planning the home until construction is complete and you are ready to move in. The answer is: it varies! There are many considerations that factor into your timeline. From additions to custom finishes to the weather, things come up that shift your final completion date. Purchasing a lot adds additional time, and there are always permits that take time. If you are building on a lake rather than other residential areas, special permits may be needed. The good news is, B-Dirt Construction takes care of the permit process, so you don't need to worry about it! Just something to keep in mind when planning your timeline. Don't let the details daunt you...when you build with B-Dirt Construction, you're part of the family! Call today and get started (218) 821-5243. B-Dirt Construction, Brainerd custom home builder, is happy to announce that building season is officially underway, and we're digging it! Road restrictions are coming off now, and spring is building season. Do you have a plan for your dream home? Choose the local company with countless satisfied homeowners and a reputation for excellence. B-Dirt Construction's skilled contractors even include our own cement crew. From start to finish, you're in the best possible hands with B-Dirt Construction. Call today for your free consultation (218) 821-5243. We look forward to meeting you! 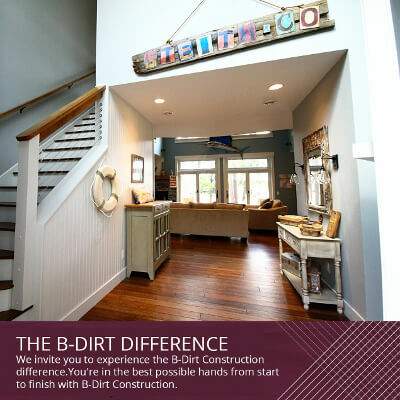 We invite you to experience the B-Dirt Construction difference. Our countless satisfied customers know first-hand what sets us apart. 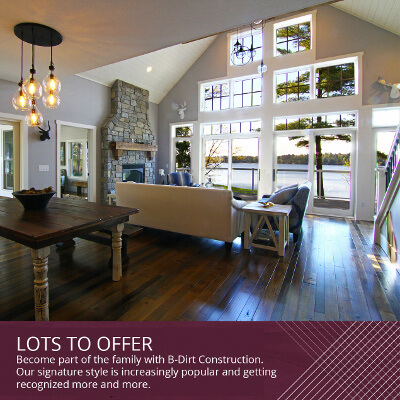 B-Dirt Construction builds custom homes in the Brainerd Lakes area. Did you know we also serve Aitkin, Alexandria, Biwabik, Crosslake, Detroit Lakes, and Emily? B-Dirt Construction is also your custom home builder in Fifty Lakes, Mille Lacs, Nisswa, Walker, Staples, and all surrounding areas as well. If you can dream it, we can build it. B-Dirt Construction has over 25 skilled employees that build our custom homes, including our own cement crew that takes care of everything from ICF (insulated concrete forms) for your foundation, to accents and fireplaces. Our own employees also frame your home, and our skilled crew finishes both the interior and exterior of your dream home. B-Dirt Construction has experienced, reliable contractors to take care of the mechanical, electrical, drywall, and plumbing. On time and on budget. You're in the best possible hands from start to finish with B-Dirt Construction. Call us today and experience the B-Dirt Construction difference: (218) 821-5243. Make A Present Of Your Present! 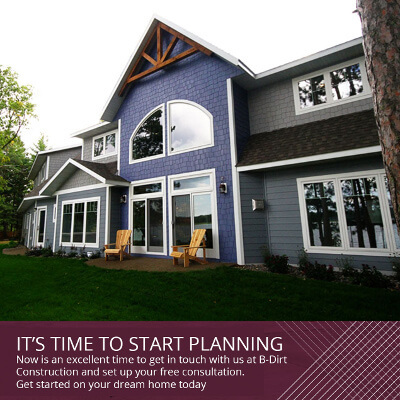 B-Dirt Construction, Brainerd new home construction company, wants to remind you that when it comes to building your dream home, there's no time like the present to start planning! Now is an excellent time to get in touch with us at B-Dirt Construction and set up your free consultation. Tell us about your dream home, everything you want to include, your family's needs, your vision, and with the help of our CAD 3D software, we can draft your plans. Browse our galleries to collect ideas—we will guide you through the entire process and make suggestions based on your needs and budget. Make a present of your present and call B-Dirt Construction to get started on your dream home today: (218) 821-5243. We look forward to meeting you! 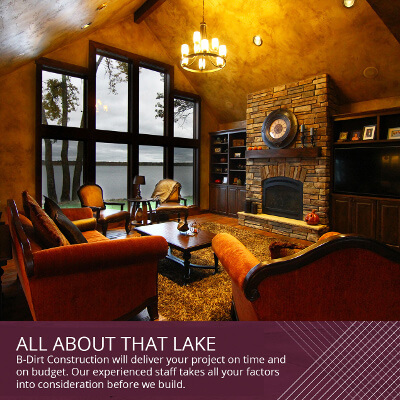 B-Dirt Construction, Brainerd custom house builder, is also your lake home specialist. We do it all—from demos to remodeling, to adding space to a lake home, to completely starting over! If you're starting from scratch, B-Dirt Construction surveys your site and builds your custom lake home to best serve your location. Perhaps you're merely looking to convert your vacation lake home to a year-round residence or retirement home. B-Dirt Construction does it all. Add a bonus room. Add a garage with living space above it. Extend or add on to given space. B-Dirt Construction will deliver your project on time and on budget, no matter how big or small. Our experienced staff takes all your factors into consideration before we build. Browse our gallery for some stunning examples of our lake homes. Then call and set up your free consultation. Our CAD 3D software brings your visions to life and helps us shape your project. Call (218) 821-5243 today. We look forward to building with you!